Our small 3-star hotel has just 10 rooms, two of them en-suite. All rooms have outside views, full bathroom, television, telephone, heating and air conditioning. 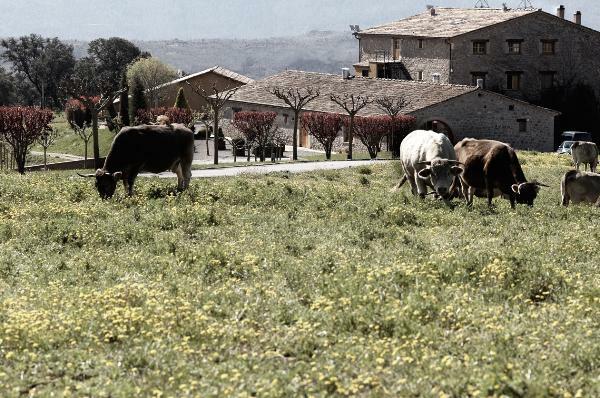 Els Casals offers both traditional dishes and nouvelle cuisine, always rooted in the local gastronomy. It is a terroir cuisine in which most of the produce comes from the family farm or nearby farms: from vegetables to eggs, milk and dairy products, poultry, pork, mushrooms, truffle … This makes the cuisine heavily influenced by seasonal produce, that is always handled with the utmost respect, so that all its qualities can be appreciated and that it can be enjoyed in the the best conditions. ENQUIRE NOW FOR MORE DETAILS OF THIS SUPERB COUNTRY HOTEL. Please note all bookings are made direct with the hotel and with no agency or booking fees.